After a hard day’s work, we all deserve some pampering when we finally get home. One way to achieve that reward is by filling the tub with warm water and lying down in the tub with cucumber slices on both eyes. To improve the mood, you play some ‘Marvin Gaye’ while wiggling your toes in the water. Plus, the diffuser is letting out some calming scents. You then begin to realize that something’s missing. The Light. You begin to light candles left and right. The mood is now all set. At some point, you finally achieve relaxation. When you get to wake up from such a rewarding and relaxing session, you get to see the aftermath of lighting candles. Wax dripping everywhere. Wax is sticking to the walls, floors, or everywhere. When you decide to clean it up, it takes a lot of time and effort to remove it. Aside from the waxy mess you get from lighting candles, you also risk getting everything on fire. The candle could easily burn towels, shower curtains, etc. You might think that a fire which started from the bathroom is highly unlikely, then think again. It does happen. Don’t risk it from burning down everything that you own. For those who’d want to avoid these scenarios, there’s one credible solution to all of that waxy and fiery mess: Dimmer switches and Dimmer light bulbs. 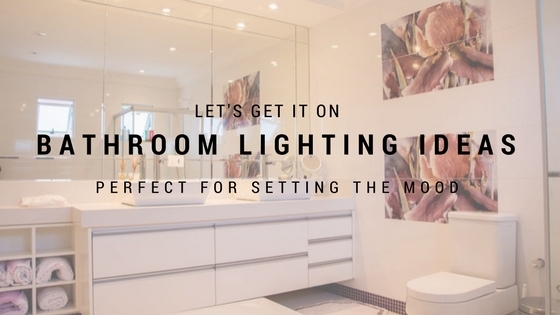 Here are some tips and tricks for lighting your bathroom. Hanging a chandelier or a cool piece over the bathtub looks stunning. To do so, follow strict building plans so that you won’t end up in an accident. Strict building codes require chandeliers and pendant-type fixtures should be 8 feet above and should not touch any part of your body while standing in the bathtub. This precaution is to ensure that no untoward accidents happen when taking a bath. When lighting the bathtub using chandeliers or pendant-type fixtures, use incandescent light bulbs as they provide that warm feeling when setting the mood. It’s also a fact that most incandescent and halogen type bulbs work well with dimmer switches. Find the perfect chandelier lamps online for your bathroom here at LampTwist. The mirror and sink are in the vanity area. It’s a good idea to place wall fixtures on both sides of the mirror. You can also provide lights on top to highlight your face once you look in the mirror. The cabinets below the sink in the vanity area should also have lights installed inside when you open them. Installing lights inside cabinets is a good idea because the lamps near the mirror will only give a glow to you and not the bottom portions of the sink. These lights help you get towels or any other items inside. These lights also switch off when you close the cabinets. Don’t want a chandelier to hang above your head? Don’t worry. You can stick light fixtures on the ceiling and the walls next to you while you take a bath. This idea might sound unsafe but with accessories that are approved for water and have specifications against dampness, then getting electrocuted won’t be possible. Bulbs and other electrical components are sealed, and no water will ever get inside these fixtures. The problem with chandeliers is that sometimes they get moisture (although lights above tubs have moisture-proof fixtures that ensure a safe bath), swap it out for LED strips to make a more luxurious glow similar to those of high-class spas. You can lighten up the mood, even more, when you incorporate dimmer switches so that you can customize the glare of the lights above you. LED lighting provides a soft and warm glow perfect for the master bathroom. However, there’s a catch: You have to place them accordingly to bring out that desired effect. Ambient lighting is the best type of light to illuminate a raised furniture-style vanity. Set these lights behind or on the sides of a shelf to create that ambiance that most people want in their bathrooms. Empty spaces sometimes are clean to look at and provide the beauty needed in a bathroom. Sometimes, too many knick-knacks can clutter up space and end up looking messy. Never underestimate what a good view a well-set lighting and clean area can give. The traditional candles that we often see in the bathroom are good sources of light that can set the ambiance . However, opting for more modern approaches like dimmer switches and dimmer lights, make less waste and hassle. Not only that, because dimmer switches also provide that exact glow that you want. Now that you’ve got your bathroom covered, why not look at some of our glorious designer lamps from Tom Raffield for your study or living room?